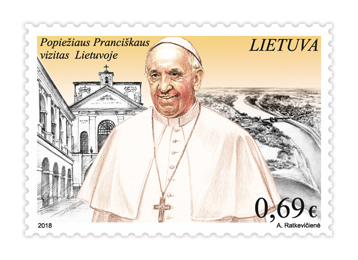 With the consent of the Vatican, after a long break, a limited edition postage stamp is issued for the visit of the Holy Father in Lithuania. 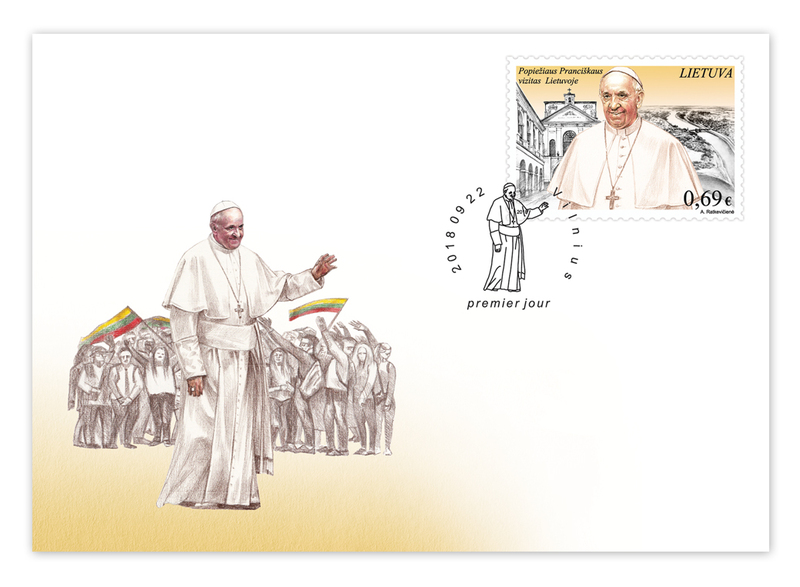 The last time Pope’s image was on the postage stamp was 7 years ago, and his official visit to Lithuania was 25 years ago. As the use of the image of the Pontiff is strictly regulated, the postal stamp created by the painter Aušrelė Ratkevičienė was created in accordance with His Holiness image and was in line with the Vatican. The EUR 0.69 postage stamp will appear on the market this Saturday, 22 September. Together with a postage stamp the edition of which is 40 thousand, the first day envelope meant for Pope Francis will also be sold. On Saturday, correspondence paid by the new postage stamp will be stamped with the first day stamp in Vilnius Central Post Office – the postage stamp, the first day envelope and the “set of stamps” are highly appreciated by the world’s philatelists. It is expected that believers from all over the world will be willing to buy a rare postage stamp in Lithuania and send postcards and letters marked with it to close people in other countries as a memorial to the Holy Father’s visit. This is the third edition of the Lithuanian postage stamps with the Pope since two postage stamps have been created for Pope John Paul II: for the first time in 1993, during his visit, and for the second time in 2011 when he was declared blessed. In 1993, 4 options of this postage stamp were issued – with the Cross Hill, Gate of Dawn, Šiluva Church and Fragments of Kaunas Church of St. George; In 2011, Pope John II and the first object of the pilgrimage route – Vilnius Arch-Cathedral were portrayed in the postage stamp. In the postage stamp that comes into the circulation this Saturday, the Pope’s Francis figure symbolically unites the fragment of the Mother of God chapel in the Dawn of Mercy in Vilnius and the confluence of the Nemunas and Neris in Kaunas – places where he will pray and meet the believers. Pope Francis (the real name is Jorge Mario Bergoglio) who was elected on 13 March, 2013, is one of the most important world leaders and the moral authority for millions of believers. For a message of hope and encouragement to Europe, contribution to global peace, the values of mercy, tolerance and solidarity, in 2016 he was presented with one of the most honourable awards in the world – Charlemagne Award. Lithuania Post issues 25-27 stamps per year. Lithuania Post also provides courier, logistics and financial intermediation services.